Madhumoti Restaurant uses their own specialised couriers to deliver their food. Beef, lamb, chicken bhuna with a touch of spices rolled over skewers and cooked in a pan, rolled in a paratha. Mix salad, cucumber, tomatoes, with a touch of spices rolled over skewers and cooked in a pan, rolled in a paratha. Deep fried triangular pastry filled with spiced mix vegetable. Deep fried triangular pastry filled with spiced potatoes, peas, and chicken. Mashed potato cakes, lightly spiced and deep fried. Onions fried till crispy in chick-pea batter. Spinach and onion dumplings marinated in chick-pea flour. (Cauliflower) Cauliflower dumplings marinated in chick-pea flour. Fish fillet marinated in ginger, garlic, special spices battered and deep fried. Slice of home made cottage cheese, special spices battered and deep fried. Vegetable roll, vegetable samosa, onion bhaji, spinach pakora, aloo tikki. Meat roll, meat samosa, fish pakora, aloo tikki. Stuffed crispy paratha with means egg and Bangladeshi style fresh spices serve with chutney and salad. Stuffed crispy paratha with cheese, egg and Bangladeshi style fresh spices serve with chutney and salad. Mix lentil and your choice of beef or goat. All items serve with salad or capsicum, onion, tomatoes with mustard. Garlic flavor chicken pieces (boneless) marinated in yoghurt and herbs. Boneless pieces of chicken marinated with mild spices and grilled in tandoor oven. Boneless pieces of chicken with beef, lamb, goat marinated with mild spices and grilled on tandoor oven. Minced chicken mixed with herbs, traditional spices and grilled. Garlic flavor of boneless fish marinated in yoghurt and herbs. Tiger prawns marinated in yoghurt, lemon and spices. Cottage cheese grill in tandoori oven with yoghurt and spices. Marinated mushroom grilled in tandoori oven with yoghurt and spices. Marinated cauliflower grill in tandoori oven. Selection of all vegetable tandoori items. Selection of chicken tandoori, and fish tandoori, panner tandoori. Garden fresh vegetables cook to traditional spices. Garden fresh vegetables cook to traditional spices without gravy. Garden fresh vegetables cook to traditional spices with vinegar and tomatoes. Fresh homemade cottage cheese cubes cooked in a creamy sauce with dried fruits. Fresh homemade cottage cheese cubes with spices, onion, tomatoes and capsicum with sour sauce. Fresh homemade cottage cheese cubes cooked in a creamy spinach sauce. Fresh homemade cottage cheese cubes cooked with green peas in a mild masala sauce. Mushroom and cottage cheese cooked with onion, tomatoes and capsicum and sour sauce. Mushroom cooked in a creamy spinach sauce. Fresh garden vegetables prepared in a spicy cream based sauce with dried fruits and cottage cheese. Vegetable balls made from mixed vegetables, cottage cheese, traditional spices. Red lentils cooked with onion chillies and other traditional spices. Red lentils and mung lentils cooked with onion, tomatoes, capsicum, punch masala and other traditional spices. Black lentils cooked in Indian style cream based sauce with other traditional spices. Red lentils cooked with onion chillies and other traditional spices in a creamy spinach sauce. Chickpeas cooked with capsicum, onion, tomatoes with sour sauce. Potatoes cooked in a spicy spinach sauce. Potatoes and eggplants cooked with curry sauce and herbs. Potatoes cook with traditional spices. Shaded potatoes cook with medium spices. Cauliflower and potatoes cooked with curry and cumin seed. Dice pumpkin cooked with curry sauce, tempered with mustard seed. Lamb cooked with freshly ground spices, tomatoes, onion and yoghurt. Lamb cooked with garlic, ginger, spices, onion, tomatoes and capsicum with sour sauce. Lamb cooked with chillies, vinegar, garlic, ginger, spices, onion and tomatoes with sour sauce. Lamb cooked with coconut curry sauce and mustard seeds. (A South Indian specialty). Tender lamb cooked with cashew nuts and a rich creamy sauce. Meat balls made from minced lamb, herbs and traditional spices. Lamb cooked with potatoes and traditional spices. Lamb cooked with spinach and special herbs, tempered with cream. Mixed dall and lamb cook with traditional spices. Lamb and mix pickle cooked with freshly ground spices, tomatoes, onion and yoghurt. Lamb cooked with mango, onion and tomatoes with traditional spices. Lamb cooked with methi, onion and tomatoes with traditional spices. Beef cooked with chillies, vinegar, garlic, ginger, spices, onion and tomatoes with sour sauce. Beef cooked with garlic, ginger, spices, onion, tomatoes and capsicum with sour sauce. Beef cooked with cashew nuts and a rich creamy sauce. Beef cooked with garlic, ginger, and yoghurt based sauce. Beef cooked with potatoes and traditional spices. A South Indian specialty of tender meat cooked with coconut curry sauce and mustard seeds. A creamy spinach sauce based curry. Mixed dall and beef cook with traditional spices. Beef and mix pickle cooked with freshly ground spices, tomatoes, onion and yoghurt. Beef cooked with mango, onion and tomatoes with traditional spices. Beef cooked with methi, onion and tomatoes with traditional spices. Chicken tandoori cooked in butter, spices and cashew nut sauce. Chicken cooked with garlic, ginger, spices, onion , tomatoes and capsicum with sour sauce. Chicken cooked with garlic, ginger, spices, onion and tomatoes with sour sauce. Chicken cooked with chillies, vinegar, garlic, ginger, spices, onion and tomatoes with sour sauce. Chicken cooked with capsicum, onion and tomatoes with traditional spices. Tender chicken cooked with cashew nuts and a rich creamy sauce. Chicken cooked with spinach and special herbs, tempered with cream. 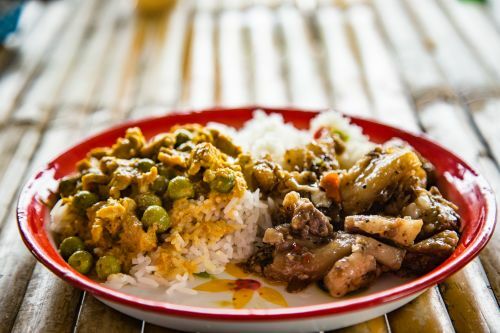 Mixed dall and chicken cook with traditional spices. Chicken and mix pickle cooked with freshly ground spices, tomatoes, onion and yoghurt. Chicken cooked with mango, onion and tomatoes with traditional spices. Chicken cooked with methi, onion and tomatoes with traditional spices. Goat cooked with garlic, ginger, spices, onion and tomatoes with sour sauce. Goat cooked with traditional Sri Lankan spices. Goat cooked with potatoes and traditional spices. Mixed dall and goat cook with traditional spices. Goat and mix pickle cooked with freshly ground spices, tomatoes, onion and yoghurt. Tiger prawns marinated in garlic cooked with tomatoes, onion and mild spices. Tiger prawns simmered with coconut cream, onion and spices, very exotic. Fish cooked with mustard onion, and mild spices. Plain flour with ghee cooked in a pan. Whole meal flour with potatoes, cauliflower and Punjab style fresh spices. Plain basmati steamed white rice. Kalizara rice cooked with butter and spices. Kalizara rice cooked with butter and green peas. Basmati rice cooked with seeds mustard and lemon juice. Basmati rice cooked with coconut and seeds mustard. Basmati rice cooked with saffron and seeds mustard. Fried pulao rice cooked with moong lentils. Kalizara rice cooked with chicken stock, chicken traditional spices serve with egg and potatoes chop. Kalizara rice cooked with goat traditional spices served with egg and potatoes chop. Kalizara rice cooked with fresh vegetable traditional spices. Kalizara rice cooked with prawn, fresh vegetable and traditional spices. Cucumber, tomatoes onion and herbs in seasoned with fresh yogurt. Cooked lentils with onion, dry fried chili and traditional spices. Mash potatoes made with onion, turmeric, fresh coriander and chili. Roasted eggplant made with fresh coriander, fresh green chili, and mustard oil. Dry prawns made with coconut, hot chili, onion, fresh coriander. Roasted tomato make with dry chili, mustard oil, onion. Boil egg made with fresh coriander, fresh green chili, and mustard oil. Beef, chicken or lamb made with hot chili, onion, freshcoriander. Combination of fresh cucumber, onion tomatoes. Salad mix with carrot and lemon dressing. Fried dumplings of cottage cheese in flavored syrup.